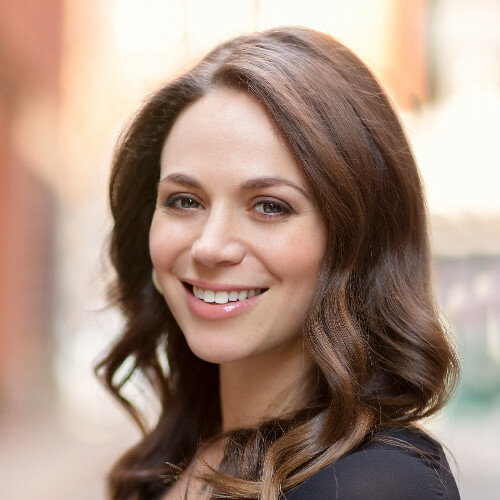 Alanna Gregory is the Managing Partner at Nonpareil. Today, operating in a high-growth environment requires meticulous definition and tracking of metrics in order to make informed decisions and measure improvement. However, setting up the analytics competency of your company can be challenging. This goes beyond just selecting and instrumenting the right tools, but rather encompasses understanding how to build a business that will produce actionable data. Let’s break it down. Whether you’re launching a new product, or your product is already live, having a solid growth plan is a helpful exercise as it not only aligns product and growth around common goals, but it also begins to set the analytical framework for how you think about measurement, ROI and growth. retention, increasing value for users of the product. What metric(s) are we most focused on growing (i.e., revenue, signups/leads, etc)? What other metrics (if any) are inputs into this metric? 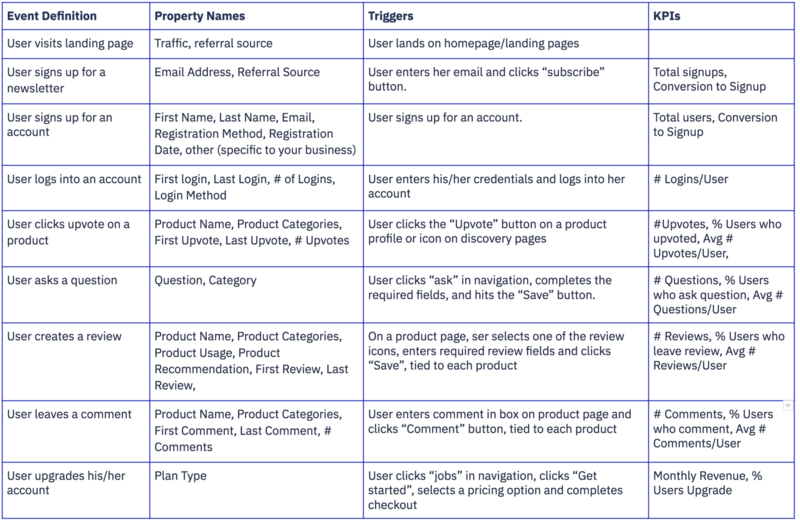 Pro-Tip: Make sure not to miss subcomponents or inputs of key goals you want to track! How many leads with a given conversion rate do we need to reach our goals? How will we grow our leads? Does this approach make sense, and for the stage we’re at? What assumptions are we making and are they reasonable, also for the stage we’re at? How will we measure and optimize the product experience itself? How long do we expect users to be active? To help guide an answer to the first question, many companies focus on growing one single metric, or their north star metric. This is the single metric that best captures a company’s core value proposition that its product delivers to customers, and often guides product development. Having your team rally around one metric can also increase focus and alignment. If your growth plan documents what you hope to accomplish, your tracking plan helps you arrive at the how, through data-driven decision making. Your tracking plan breaks down each of your business goals into events and meaningful actions a user takes, their associated business metrics, and where those events live. Acquisition: The most important thing we want to understand here is how we’re growing top of funnel, and of course, our rate of growth. Depending on our business model, we want to add in additional metrics. Activation: At what rate are users taking the key actions, how many active users do we have? Retention: At what rate are people churning, how satisfied are they (Net Promoter Score)? We may want to slice retention by user behavior, traffic source, and more to understand what levers lead to retention, and how we can improve the product experience. Based on this information, and at this stage, what would you recommend instrumenting? Acquisition: We’re focused on driving top-of-funnel traffic, and are interested in how people come to view our content. Activation: Here, we want to evaluate how users go from passive readers to active members of our community. Retention: Ultimately, the success of our site and content depends on how often and what percentage of people return. Implicit here is that you have an understanding of the dynamics of your business model that will guide both your growth plan and help you identify what metrics to track. Note that I’ve presented a simplified tracking plan here and excluded columns such as Property Types and Data Types for each property, for simplicity’s sake. Now it’s time to operationalize your tracking plan. 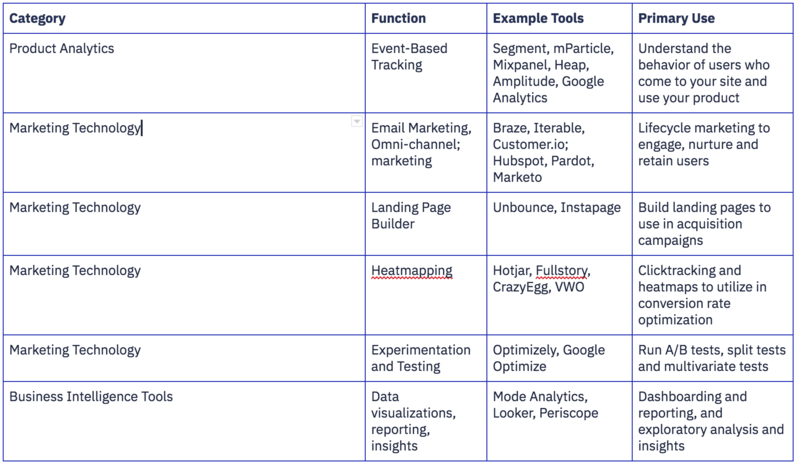 There are many tools across marketing, product and analytics. You likely want to understand the amount of data you’re tracking, how complex your problems are, your budget for these types of tools, and your business objectives as you select tools to architect your growth stack. Pro-Tip: Invest the time to understand each tool’s strengths and shortcomings, and how these map into the current needs, requirements and priorities you’ve outlined for your company. For your product and engineering team to properly implement the various marketing and analytics tools, all of your implementation requirements through should be documented in your tracking plan, usually delivered through a spreadsheet. This becomes the key communication tool between product and engineering teams. It’s important that each tool is implemented exactly to the specification and that the data is QA’d and feeds into each service cleanly. As the saying goes, garbage in, garbage out. Finally, adoption is critical. The tool is only as valuable as the data you feed into it, so make sure all the data you need feeds in, and that people on your team are able to use the tool and make sense of the insights. Now that you’re tracking data, you want to continually focus on improving your metrics. To do this, it can be helpful to take stock of where you are and critically evaluate your growth plan. What’s working, and what’s not? Why might something not be working, and what can we learn from that? We start by considering, first, if we are on pace to hit our KPIs that we outlined in step one. If not, we must diagnose the core issue. Is it because of a lack or users (acquisition), a lack of engagement (activation), or high user churn (retention)? Next, we’ll want to dive deeper into the parts that are both working and not working. On what’s working, how can we expand that strategy? On what’s not working, what other experiments can we shift to? How are the quality of the users we’re acquiring, and how do these vary by channel? Having a solid underlying analytics framework and a data-driven approach to both product development and growth is a continuous process and requires thoughtful planning, and collaboration across teams. The earlier you and your team start, the better!